Now on display at the Olin Library on the main campus of Washington University are 200 books. The content is notable but not necessarily rare: Abraham Lincoln's Emancipation Proclamation, a Japanese prayer scroll, campaign material supporting Theodore Roosevelt. It is the books themselves — none is more than 3 inches by 3 inches — that are amazing. The items at Olin are only a part of the collection of Julian I. Edison, who has been a member of the Washington University Libraries' National Council since 2000. A collector of miniature books since the 1950s, he has been the editor of "Miniature Book News" for 40 years and is the coauthor, with Anne C. Bromer, of "Miniature Books: 4,000 Years of Tiny Treasures." That, too, is the name of the exhibit. These tiny books are less than one inch. 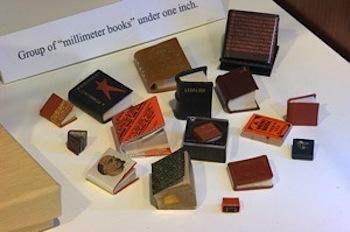 Why miniature books? Some are produced simply for the beauty and challenge of creating them. Because they are so small, according to the university, they are useful for "political propaganda, dictionaries, religious books and almanacs." If you go, make sure not to miss a book with a letter by Galileo on science and religion. Printed in 1896, it has 200 pages and is less than one inch in height. The exhibit, which is free, runs through June 6. The Olin Library is in the center of the main campus: west of Brookings Quadrangle, east of Graham Chapel and northeast of Mallinckrodt Center. For directions or library hours, visit the library's website.